"Praised Be JESUS CHRIST The King And Mary Forever!!! Amen!!!" "All wisdom is from God, and is given to them that fear and love God." "I will praise thy name continually, and will praise it with thanksgiving, and my prayer was heard." Ecclesiasticus Chapter 51 Verse 15. 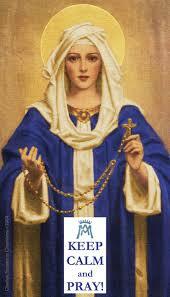 At the Holy Hour (March 25, 1912) the Blessed Virgin spoke thus: "I have called myself the Immaculate Conception. To you I call myself Mother of the Sorrowful Heart. This title willed by my Son is dear to me above all others. According as it is spread everywhere, there will be granted graces of mercy, spiritual renewal and salvation." Sorrowful and Immaculate Heart of Mary, dwelling pure and holy, cover my soul with your maternal protection so that being ever faithful to the voice of Jesus, it responds to His love and obeys His Divine Will. I wish, O, my Mother, to keep unceasingly before me your co-redemption in order to live intimately with your Heart that is totally united to the Heart of your Divine Son. Fasten me to this Heart by your own virtues and sorrows. Protect me always. Second Book of Machabees Chapter 12 Verse 46.
" It is therefore a holy and wholesome thought to pray for the dead, that they may be loosed from sins." O Thou most BELOVED, most MERCIFUL LORD JESUS CHRIST, into Thy HOLY ALMIGHTY HANDS we COMMEND ourselves for ALL eternity, as well as in the HEART of the the MOST HIGH GOD of the ETERNAL TRINITY! We take REFUGE in the DEEP WOUNDS of Thy MOST HOLY BODY. May Thy MOST HOLY BODY nourish us, Thy MOST PRECIOUS shed BLOOD, FEAR and SUFFERING purify us of ALL our sins and vices! Oh, Our DEAR LORD GOD, we humbly offer Thy GREAT FEAR and NEED to Thy HEAVENLY FATHER in expiation for ALL our SINS and DEBTS! May the TERRIBLE BLOWS Thou didst endure PLEAD for us! May Thy MOST PAINFUL SCOURING cover our GREAT guilt! We offer ALL Thine INJUSTICES, DEEP WOUNDS GREAT PAINS and SIGHS to Thy HEAVENLY FATHER, for ALL our neglects. May Thy GREAT LOVE, oh dearest JESUS reconcile us with Thy DIVINE JUSTICE and with Thee! Oh MOST MERCIFUL JESUS, may Thy FAULTLESS JUDGMENT be for us the FORGIVENESS of ALL our SINS, known and unknown; may Thy SHAMEFUL DENUDING make us pure in body and SANCTIFY our souls! May Thy BITTER AGONY, Thy HOLY WOUNDS SHIELD us from our visible and INVISIBLE enemies! May Thy PIERCED HANDS and FEET LEAD us to ALL GOOD! Oh dearest Lord, PLACE us and HIDE us in Thy 5 MOST HOLY WOUNDS! FORGET NOT our poor souls for which thou didst so AGONIZINGLY TREMBLE on the stem of the HOLY CROSS! For the sake of ALL the MARTYRDOM thou didst SUFFER, reconcile us with Thy DIVINE JUSTICE! May Thy MOST HOLY AND BITTER DEATH PROTECT us and lead us to ETERNAL SALVATION! May Thy MOST BLESSED POWER and DIVINE OMNIPOTENCE drive away and KEEP away from us EVERY evil of body and soul! May Thy MOST HOLY WOUNDS, dearest JESUS, BLESS us and PROTECT us in OUR death agony from ALL power of the infernal enemy! At the hour of OUR death, may Thy MOST PRECIOUS BLOOD erase ALL our SINS before our BELOVED HEAVENLY FATHER, and let die in us ALL inclination to sin! May Thy MOST PRECIOUS BLOOD lead us to all ANGELS and SAINTS! We commend and place ALL our suffering friends and ENEMIES and ALL deceased persons to and into Thy MOST LOYAL REDEEMER'S HEART! Oh dearest JESUS, give to us ALL thine INFINITE MERITS, the POWER and the BLESSING of Thy MOST BITTER PASSION and DEATH! Oh ETERNAL DIVINITY, oh TRUE HUMANITY of JESUS, oh MOST BLESSED TRINITY, PROTECT us now, according to Thy DIVINE desire, and FOREVER! Oh ALMIGHTY and IMMORTAL GOD, have MERCY on ALL! AMEN!! !